← Wouldn’t you in Woodinville? If you divided Niagara Falls into four or five sections, one of those pieces would look very much like Snoqalmie Falls in Washington State, about 30 miles from Seattle. 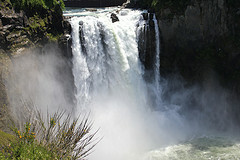 Its swirling waters shoot off a cliff with a force that sprays onlookers stationed at a viewing area. It’s got a nice picnic area and gift shop but as luck would have it, the hiking trails were closed on the day of my visit. So no walking for me here, just a spectacular view of Mother Nature’s handiwork.